Eden Tolly Signature is a landmark project in the Tollygunge Area. Fabulously located only 3.5 kms from Tollygunge Metro - one of the most important urban hubs of Kolkata. On the other side it is connected to Diamond Harbour Road, which is one of the most important transport channels for Kolkata and for South Bengal. Eden Tolly Signature, being a large residential complex of around 300 units in Kolkata, will feature the most desired amenities for its residents like Swimming Pool for children, modern Banquet Hall, well equipped Gymnasium and a state of the art Home Theatre. With facilities like an Indoor Games Room, Badminton Court, Gymnasium and the Pool, your spouse will not be able to find excuses to skip exercise any more and your children will get the benefit of all-round development. With the most modern specifications and modern urban planning, we aim to make life much easier and luxurious for customers. Our quality is epitomised in our clear indication of the brands of materials provided by us. Structure:RCC-framed structure with anti-termite treatment in foundation.Cements used: Ambuja, Lafarge, Ultratech, Birla, ACC*. Elevation:Modern elevation, conforming to latest international designs. External Finish:Ace Exterior Emulsion* Paint by certified Asian Paints/Berger applicator*, and other effects as applicable. Doors & Hardware:Quality wooden frames with solid core flush doors. All doors with high-quality laminate on both sides. Door handles of Godrej*. Main door with premium handle and eyehole. Main Door Lock by Godrej*. Windows:Color anodized / Powder coated aluminium sliding windows with clear glass (using high quality aluminium) and window sills. Flooring:Vitrified tiles in bedrooms / living / dining. Marble in kitchen:Ceramic tiles in toilets. Kitchen counter:Granite slab with stainless steel sink. Wall tiles upto 2 (two) feet height above counter. Toilets:Hot and Cold water lines with CPVC* pipes (new plumbing material from Noveon, USA*). CP fittings of Jaguar*.Dado of ceramic tiles up to door height.Light-coloured sanitaryware with EWC with ceramic cistern and basin with pedestal of Hindware*. Electricals1.Concealed Polycab* copper wiring with modular switches. Structure: RCC-framed structure with anti-termite treatment in foundation.Cements used: Ambuja, Lafarge, Ultratech, Birla, ACC*. External Finish: Ace Exterior Emulsion* Paint by certified Asian Paints/Berger applicator*, and other effects as applicable. Doors & Hardware :Quality wooden frames with solid core flush doors. All doors with high-quality laminate on both sides. Door handles of Godrej*. Main door with premium handle and eyehole. Main Door Lock by Godrej*. Windows:Colour anodized / Powder coated aluminium sliding windows with clear glass (using high quality aluminium) and window sills. Flooring:Vitrified tiles in bedrooms / living / dining.Marble in kitchen. Ceramic tiles in toilets. Kitchen counter:Granite slab with stainless steel sink.Wall tiles upto 2 (two) feet height above counter. Electricals:1.Concealed Polycab* copper wiring with modular switches. Water Supply:Underground and Overhead storage tanks of suitable capacity. Borewell will be available as an auxiliary water supply. Generator:24 hour power backup for all common services. Generator back up of 350 W for 1 bedroom flats, 500 W for 2 bedroom flats and 750 W for 3 bedroom flats. Security:Intercom facility, CCTV cameras and 24/7 security personnel. 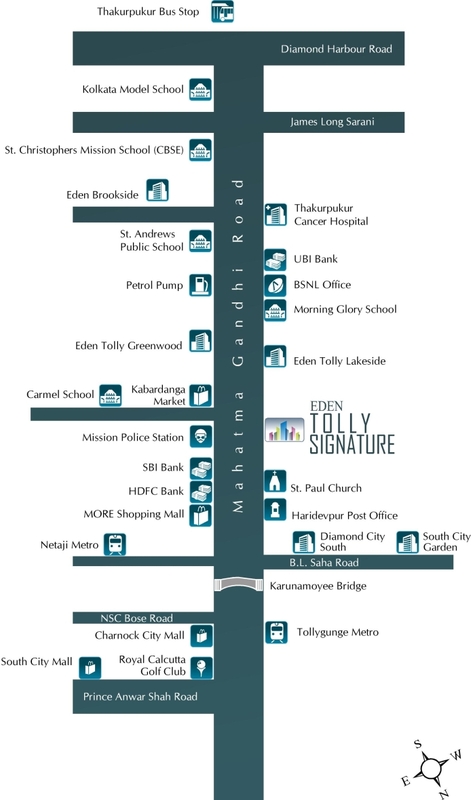 Eden Tolly Signature is fabulously located only 3.5 km from Tollygunge Metro - one of the most important urban hubs of Kolkata. On the other side it is connected to Diamond Harbour Road, which is one of the most important transport channels for Kolkata and for South Bengal. Charges below are on a per sq. ft. basis 81/- per sq. ft.